The Temperance Movement have revealed the video for their acoustic version of “White Bear”, the title track taken from the upcoming new album, which will be released on January 15th through Earache Records. Recorded live at YouTube HQ in London, the acoustic version of “White Bear” is a humble and evocative take on one of the album’s most anthemic and moving songs. The band have also recorded acoustic versions of two bonus tracks that will appear on the upcoming album. The first, “Do The Revelation“, will be made available exclusively as a bonus track on Spotify. The second is their acoustic performance of “Time Won’t Leave” for Apple Music/iTunes Connect which will feature as an exclusive bonus studio track on the iTunes edition of White Bear. Due for release on January 15th, the album White Bear follows their critically-acclaimed 2013 self-titled debut and was recorded with producer Sam Miller in London, Northamptonshire and Monmouth. True to the band’s mantra of recording songs in three takes or less, there is an immediacy, drive and spontaneity to the album that makes the songs crackle with adventure and sheer chemistry. 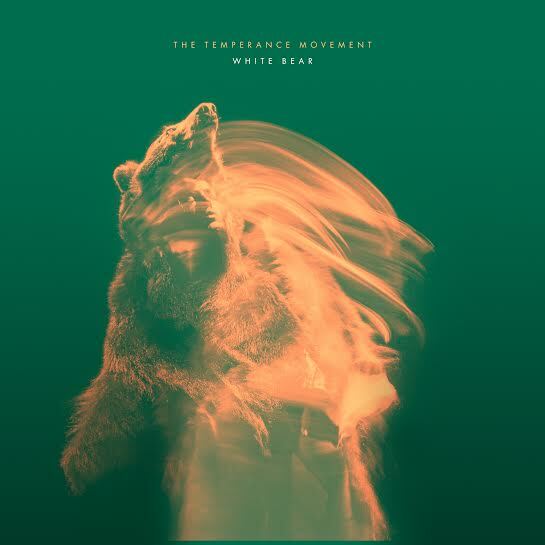 Putting a modern stamp on hard rock and blues, The Temperance Movement have crafted one of the most intoxicating records of recent times with White Bear; an album that is both expansive and electrifying. Opening with the swaggering “Three Bulleits” (titled after the Bulleit brand of bourbon favoured by some of the band), White Bear runs the whole gamut of modern rock’n’roll. From the classic Faces/Crowes R&B stylings of “Get Yourself Free” – which comes complete with a raw soul vocal from Campbell and Crosby, Stills & Nash-style harmonies from the band – to the explosive pace of the adrenaline-fuelled “Modern Massacre”, White Bear is a masterclass in songwriting from a band at the peak of their powers. It’s little wonder that The Rolling Stones hand-picked the band to support them on four massive arena shows. In a new behind the scenes video The Temperance Movement discuss hanging out with Mick Jagger in his dressing room as well as getting guitars signed by Keith Richards. As we approach the release of the album, The Temperance Movement are unveiling short films detailing life in the band and the creation of the album. Part One saw the band discuss the process behind writing White Bear and deliver an intimate insight into its recording in the studio. Part Two features them discussing the trials and tribulations of life post-tour and the pressures of being in a working band that led to guitarist Luke Potashnik’s recent departure. In the third and final part the band discuss touring the US. Watch Part Three here. The Temperance Movement have also revealed the secrets behind the intriguing album title White Bear in a new video recorded at YouTube HQ in London. The title refers to a psychology experiment conducted by Daniel Wegner that explores the idea of attempting to suppress unwanted thoughts. Don’t miss The Temperance Movement on tour in the UK in support of White Bear. London has now been changed to the O2 Forum in Kentish Town. All existing tickets remain valid.